The western Surat and Eromanga Basins tenements cover an extensive area in the Tambo and Blackall region in Queensland. The Company’s tenures predominantly are pastoral areas and lie to the west of the bulk of cropping land regarded as strategic to the State. The Company’s Blackall Project is located approximately 130 km south-west of the Alpha area coal projects. When considered in the context of neighbouring coal projects to the south of the Company’s tenements, a major new coal province has emerged in the Blackall Region. In this respect, the Company is ideally placed at the forefront of this new coal province. The Blackall Project has access to an existing rail corridor and is in relatively close proximity to the existing Central Rail Line to Emerald and Gladstone and the proposed Galilee Rail infrastructure planned to connect to Abbot Point. EPC1993 and EPC1719 are located in the north-western corner of the Blackall Coal Project near the township of Blackall and centred 20 kilometres south-east of the town. The Company’s Inverness Deposit is located in the western part of EPC1993, with the northern five kilometres of the deposit extending into EPC1719. Other than public road easements, all land in the Inverness Deposit area is privately owned. Within the Western Surat Basin the Company holds EPC 1625. The Company has identified numerous significant coal intersections in water-bores within the Western Surat Basin which are clearly much higher in the sequence than the Birkhead Formation. The Company considers that they demonstrate the presence of a hitherto unrecognised lateral equivalent of the Upper Walloon sequence ( the Juandah Coal Measures) in a region where conventional interpretations have the prospective Walloon Coal Measures thinning westward across the Nebine Ridge and grading laterally into the Birkhead Formation. 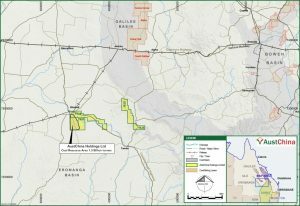 The information in this announcement that relates to the Resource Statement has been based on information compiled by Mr Rowan Johnson who is a Member of the Australasian Institute of Mining and Metallurgy and is a Senior Geologist employed by McElroy Bryan Geological Services Pty Ltd (MBGS). Mr Johnson has more than 30 years experience as a geologist in the resources industry and more than 15 years experience in the estimation of coal resources for coal projects and coal mines in Australia and overseas. This expertise has been acquired principally through exploration and evaluation assignments at operating coal mines and for coal exploration areas in Australia’s major coal basins and in other coal basins overseas. This experience is more than adequate to qualify him as a Competent Person for the purpose of Resource Reporting as defined in the 2004 edition of the JORC Code.